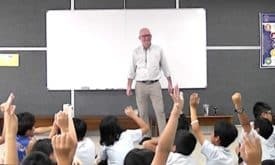 Dave talks with 4th graders at Saigon South International School in Vietnam. Dave Fox offers lively and energetic talks – everything from short, single session workshops to extended writer-in-residence programs at schools and on school trips. He packs his presentations with proven techniques to facilitate a richer understanding of foreign cultures, and demonstrates effective methods students can use to write about their international and intercultural experiences. He is available to teach his workshops worldwide and will tailor his talks to fit your school’s goals, needs, and budget. For information on how to hire him, you can e-mail him directly at [email protected]. Below, you’ll find a sampling of some of his most popular talks. If you’ve got another topic in mind, he welcomes queries and ideas. Dave has worked with students of all ages, from elementary / primary school up to the university level. He can customize his talks to fit students of any age. He is comfortable teaching to both native English speakers and English-language learners. For schools that offer educational trips, Dave can be available before, during, and after the journey to help students be more observant travelers and help them process and write about their experiences. Most travelers rely on a camera of some sort to document their journeys, but there are so many things a photograph can’t capture, from sounds and smells, to fascinating stories from people we meet, to the so-called “inner journey” – the unique emotions we encounter while traveling. Children and adults face the same two challenges: writing in a way that fully captures their travel experiences … and simply finding time to write when there’s so much to do during an exciting trip. Dave teaches fun and effective techniques for journaling before, during, and after a journey. Students learn how to splash lots of bold detail into their notebooks – quickly – so that their most meaningful moments of each day can be captured in a 10 to 15-minute writing blast. He has also worked as a newspaper and radio journalist and is happy to design programs for journalism classes on topics such as news gathering and reporting, interviewing, and related issues. When we leave our cultural comfort zones, it can stir up new emotions and thoughts – both positive and negative. Students learn to examine their personal cultural perspectives and re-evaluate their first reactions to foreign places and societies. They discover foreign sub-cultures within their own communities, and attain a better understanding of the fact that we each have our own sense of “reality,” and that exploring the realities of others with an open mind can yield great rewards. Many people think of travel writing as a “dream job.” And yes, it’s an exciting career that enables you to explore the world and meet fascinating people – but it takes hard work to become a pro. It’s not a simple matter of developing your writing style. You must be willing to endure uncomfortable experiences in the interest of finding stories. You must also be a salesperson who knows how to market your work. And being a travel writer is not a vacation! As you explore new places, you must have the self-discipline to get the job done! In this talk, Dave explains how he has combined his two greatest passions – travel and writing – into an unconventional but thrilling career and life. He explains the steps he went through to become a professional writer; how he researches, writes, and edits his travel articles; and how to “travel with a writer’s eye,” scoping out unique stories as he wanders the planet. It’s so easy these days to copy other people’s writing and photography from the Internet and claim them as our own. Many students don’t understand this is not only cheating; it’s illegal. In 2012, shortly after moving to Singapore, Dave discovered that Jon Flatland, a Minnesota newspaper editor and former president of the North Dakota Newspaper Association, had not only plagiarized one of Dave’s humor columns, but was also stealing the work of other humorists on a weekly basis and claiming he wrote it himself. When Dave talks to students about plagiarism, he tells a powerful story about how he caught Flatland and demonstrates that while it’s easy to plagiarize, it’s just as easy to get caught. He talks about how plagiarism can impact students’ lives. He also addresses the concept of “accidental plagiarism” and the importance of attribution. Students learn when it’s okay to use words or images from the web (and when it isn’t), and how to do so legally and ethically. Dave is also available to travel with school groups on single and multi-day, educational trips. He teaches journaling and cultural observation exercises along the way and works with teachers and other trip leaders to provide the most immersive and insightful journey possible. For 16 years, Dave worked as a professional tour guide for European travel guru and television host Rick Steves. When accompanying school trips, Dave’s primary role is usually to serve as a writing or cross-cultural mentor for students and an advisor for trip leaders; however, he is also highly experienced in handling group travel logistics and helping to troubleshoot the surprises that inevitably pop up in any group journey. Facilitating rich, hands-on experiences in foreign places, helping students write about or discuss those experiences in insightful ways, and critiquing cultural learning and personal growth on student trips, can be tricky to teach and evaluate. Dave’s teacher trainings, workshops, and keynotes offer educators the knowledge and skills they need to provide students with the most immersive and insightful intercultural experiences possible. Many international schools ask their students to write a journal or a blog when they go on school trips, but how do you teach and assess such writing? A travel diary is, after all, a personal thing. Writing an effective travel journal requires a vastly different approach from traditional writing techniques. And evaluating a student’s intercultural absorption and personal growth is never an exact science. In Dave’s journaling workshops for educators, he offers lots of fun, hands-on techniques teachers can use to help students write about their travels in meaningful ways. He provides effective methods for teaching and critiquing student travel journals and essays. He also addresses the value of having students write a private travel diary just for themselves, and explains how those private journals can still be effective teaching tools. If you have a budget to bring Dave to you, he’s willing to travel just about anywhere. Our planet is big, however, and he understands that many schools don’t have funding to fly him to other parts of the globe. For this reason, Dave also offers virtual workshops via Skype, and consulting via Skype and phone. He also teaches online courses in travel journaling and travel tale writing, humor writing, and the psychology of writing, and offers these do-it-yourself courses (suitable for high school students and adults) at significant educational discounts. Please contact him for more details. If you would be interested in talking with Dave about the ways he can help your school, please e-mail him at [email protected], and tell him a little bit about your school or organization, and your goals for working with him. He’s happy to schedule a conversation via phone or Skype.